Australian beach hamlets and coastal towns are popular holiday destinations during school holiday time – and with good reason. The Australian coastline is one of our country’s most recognisable and adored assets. While families often choose to holiday in these beautiful locations, we need to recognise and talk to our children about the physical differences of their roadways. Limited or no footpaths for children to know where to stand or walk. No curb, guttering or line-markings to differentiate the road from the verge. Limited or no marked pedestrian crossings. Shrubbery that often seamlessly blends the boundary of the property to the edge of the road. Without year-round volumes of pedestrian traffic, the default speeds are often 50 km/h speed limits. We know that 55% of pedestrians would die if struck by a vehicle at this speed while at 40km/h, 75% of pedestrian would survive. All of these features add to the aesthetic of our coastal areas but can often be confusing to young children who are still developing an understanding of how to behave around roadways. 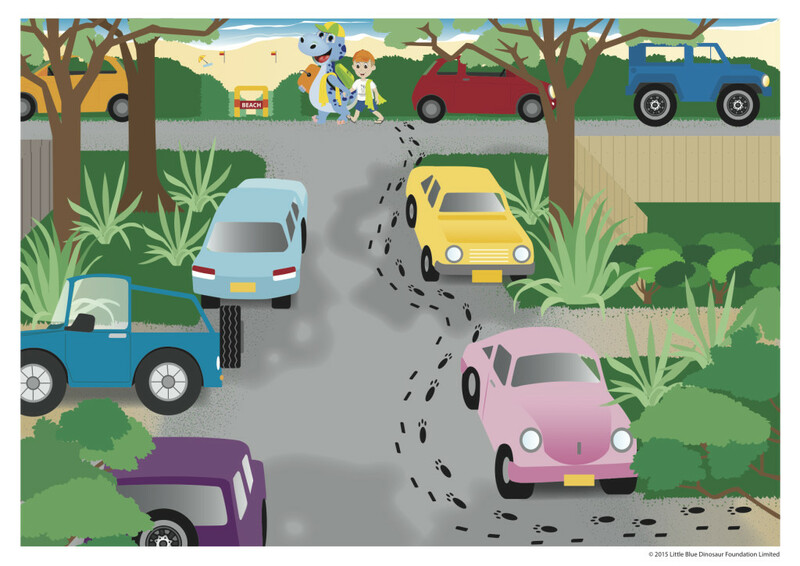 Research by Australian road safety experts tells us that children rely heavily on visual cues to determine their behaviour so if a roadway looks different, we should always explain what these specific distinctions are and outline how our children must behave when near these roads. It is common for cars to be parked on the verge between a roadway and a property in these regions, meaning when we walk with children down to the beach, park or café, we sometimes need to use the road as our path to get there. This could be very confusing to children who may begin to think of the roadway as a footpath they can use recreationally. Therefore, a quick conversation about why we’re using the road to get from A to B is prudent before leaving the property. Mentioning that this would never happen on roadways at home is important to ensure our children understand this practice is not commonplace. And as always, the crucial message of “Hold my Hand” is as important as ever when we’re in areas with differing roadways and especially if you’re using a road to walk on. We should always be holding our children’s hands until at least 10 years old (while closely supervising them until 12) when we’re on or near a road, as well as continually modelling safe roadway behaviour for them to follow. When we get to our holiday destination (even if it’s not a beach hamlet), it’s wise to have a family discussion about the way the roadways in the area look and how we are expected to behave when we leave the house, apartment, caravan, or tent. Throughout the duration of your stay, you should reiterate that street play is never ok. While families are often more relaxed in holiday regions, it’s important to know that recreational activities on roadways can be extremely dangerous. Tragedy can strike even on the quietest of streets, despite whether cars are travelling at relatively low speeds or even simply reversing from a driveway. During holidays, our children are often extremely excited to be participating in recreational activities. This excitement can make our otherwise responsible and road-safety-conscious children quite unpredictable. The fun and excitement during the school holiday period deserves to be enjoyed by the entire family, so taking a few precautionary measures and reminding our children about the importance of safe roadway behaviour could in fact be lifesaving.